LONDON (Reuters) - If British Prime Minister Theresa May hoped a televised address late on Wednesday would help persuade wavering lawmakers to support her Brexitdeal, it appears to have backfired, instead alienating the very people she needs to win over. On Thursday, lawmakers lined up to attack the statement in which May blamed parliament for the need to seek a delay to Britain's March 29 European Union exit. They branded it dangerous, reckless, toxic and irresponsible. May's Brexit deal has twice been crushed by parliament, first in January in the largest government defeat in modern history and again this month by a smaller, yet still sizeable, margin. She needs to win over at least 75 lawmakers to get it through. "The Prime Minister's statement was disgraceful," said opposition Labour lawmaker Lisa Nandy, who represents a Brexit-supporting area. "Pitting parliament against the people in the current environment is dangerous and reckless," she added on Twitter. "She's attacking the MPs (Members of Parliament) whose votes she needs. It will have cost her support." Nandy had put forward a proposal which backed May's deal on the condition parliament has a greater say in the next phase of Brexit talks, but told ITV: "I will not support a government that takes such a dangerous, reckless approach to democracy." After writing to the EU on Wednesday to request a three-month delay to Brexit, May told Britons parliament had done "everything possible to avoid making a choice". "Of this I am absolutely sure: you the public have had enough. You are tired of the infighting. You are tired of the political games and the arcane procedural rows," she said in the televised statement from her Downing Street office. May's statement succeeded in uniting both pro-Brexit and pro-EU lawmakers - against her. "If you are trying to persuade numbers of MPs to back a proposition, you don't do that by insulting them," pro-Brexit Conservative lawmaker Mark Francois told Sky News. Conservative Sam Gyimah, who quit as a government minister over the Brexit deal and now supports a second referendum, said May resorting to a "blame game" was "all part of her strategy to run down the clock and rule out other options. Toxic." Several lawmakers said they had received death threats in recent weeks as Brexit has come to a head in parliament, and warned May's comments had fuelled the flames. "Last week I received a message saying that my head should be chopped off," said Labour lawmaker Paula Sherriff, who represents an electoral district neighbouring one where Labour lawmaker Jo Cox was killed by a man obsessed with extreme right-wing ideology a week before the 2016 Brexit vote. "I apprehended the prime minister last Thursday evening and I begged her 'dial down the hate prime minister,'" she told parliament. "People are frightened ... and the prime minister must show some leadership." Fellow Labour lawmaker Wes Streeting said May's speech had been incendiary, warning on Twitter "If any harm comes to any of us, she will have to accept her share of responsibility." Asked about the suggestion May's speech had put lawmakers at risk, her spokeswoman said: "I would flatly reject that." "It was a message to the public on a significant decision she has taken," she said. In response to the concerns, parliament's Speaker, John Bercow, told lawmakers: "None of you is a traitor, all of you are doing your best ... I believe passionately in the institution of parliament, in the rights of members of this House and in their commitment to their duty." "The sole duty of every member of parliament is to do what he or she thinks is right." 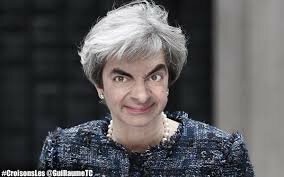 Theresa May fought tooth and nail to bypass Parliament and govern by executive order. Her comments this week are an utter disgrace. Ho much long can she last ? She has alienated everybody now. Her refusal to countenance anything but her deal is pushing the country towards no deal. Will the be a palace coup or a vote of no confidence next week? Her refusal to countenance anything but her deal is pushing the country towards no deal. May always, always takes the line of least resistance and sides with the most powerful party. That is what she has done throughout her political rise. She knows nothing else. Unfortunately for her, this doesn't work in this set of circumstances. But that doesn't stop her from trying it over and over. It has always worked in the past, so it must work again is her thought process. The most powerful actor in Brexit is the EU. The EU wants to ensure that the maximum power rests with the EU Commission. Brexit weakens that through the exit of its second largest economy and through the appearance of a trend of the EU getting smaller and less relevant. Thus when the UK leaves, the EU Commission has to ensure it leaves on very poor terms to send a very strong message to others. So May's political instincts are to cosy up to the EU. She does this and comes back with a very weak wishy-washy deal. This is rejected by Parliament and the British people unsurprisingly. And then she repeats it over and over hoping to wear the weaker parties down. What she needs to do is be bold. By using other out of the box negotiation tactics. By simply calling the EU's bluff and going for a hard Brexit. By calling the leaver's bluff and calling a second referendum. By resigning. But she can't do that because she is not that type of politician. It is always caution with her by siding with the establishment and the most powerful player. Most of the Tories supporting her will be out of a job come the next election, including the party chairman Bradon Lewis, who presides over a constiuancy that voted to leave by 72%, Great Yarmout, we were never asked about a "deal" the vote was to leave. What’s the problem with Toris being out of a job? So many Brexit threads and so little time left - come on Parliament 'do your thang' and Revoke Article 50 and let's call the whole advisory thing off and get back to real issues affecting the UK not this 1000 day nonsensical distraction. For our American freinds, it's tor-mart-to btw. She certainly seems to be alienating the very people that she needs to get her stinker of a deal through. Hopefully this is another step towards a clean break on WTO terms on 29 March (or April/May at the latest). What are you talking about? You weren't asked about a deal, you were assured, like the rest of us, that not only would we get a deal, but that it would be "one of the easiest in human history". we were never asked about a "deal" the vote was to leave. 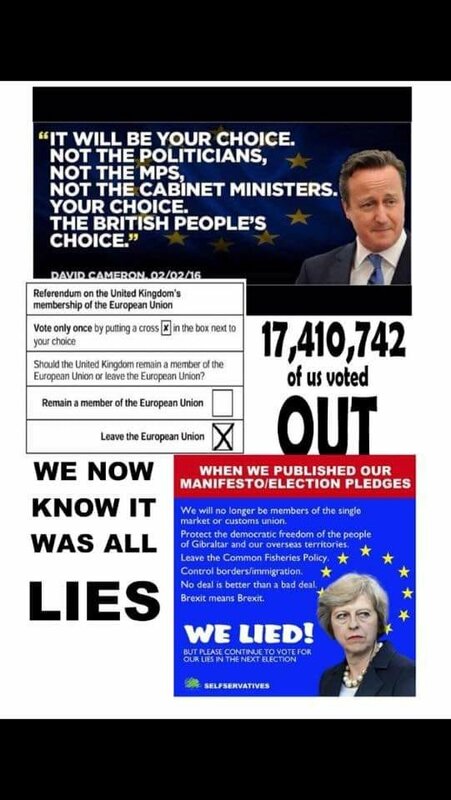 Advisory referendum validated by Cameron (gone) and then May (in office not in power) our sovereign national parliament will now decide as it should be and in accordance with law and our (unwritten) constitution. God Save the Queen. 12 April at the earliest. But it's clear that both the EU and parliament will now have time to decide something (May's deal, Common Market 2.0, Norway Plus, or revoke Article 50) to avoid No Deal. Her surrender agreement has already been kicked out twice. How can it be put to parliament again? Unless there is some collusion with Remainer Bercow, we should be out No Deal by 12 April. So there probably be more biased rule bending be Bercow and the meaningless vote is held again next week. Of course it will be rejected again, after it’s two previous humiliations for May. Back to a slightly delayed Brexit on 12 April. 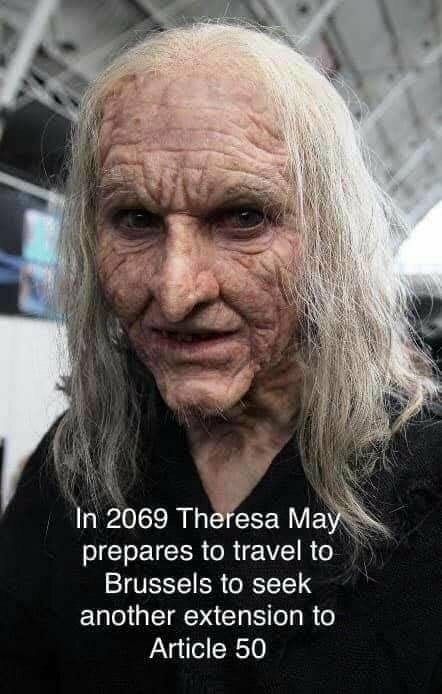 Her deal could only be passed if all the CON rebels are brought back under control. That’s not going to happen, so it would need LAB to change their votes. They are overwhelmingly Remainers anyway, so BRINO could suit them if the party lines change. Why was Corbyn on a Brussels trip and is now talking ‘compromise’? The cross party Remain plot thickens.